I can't think of a better way to celebrate Father's Day than lazing by the ocean, listening to free jazz and dining on fish and chips (no cooking!) and that's exactly what a day at the Wynnum Manly Jazz Festival offers. Each year on Father's Day, Bandstand Park below Gordon Parade at Wynnum comes alive with the sounds of all types of Jazz, from The Andrews Sister Tribute Band, to the Walk Around Pops Band and the sounds of the Royal Australian Navy Big Band. There are plenty of other bands too, including MacGregor State High School's Big Band, The Clem 7 Band and the fabulous crooner Craig Martin with his Swing Band. The Andrews Sisters Tribute Band perform classic World War Two Songs, including Chattanooga Choo Choo, The Boogie Woogie Bugle Boy and Rum and Coca-Cola and are backed by a swinging big band. 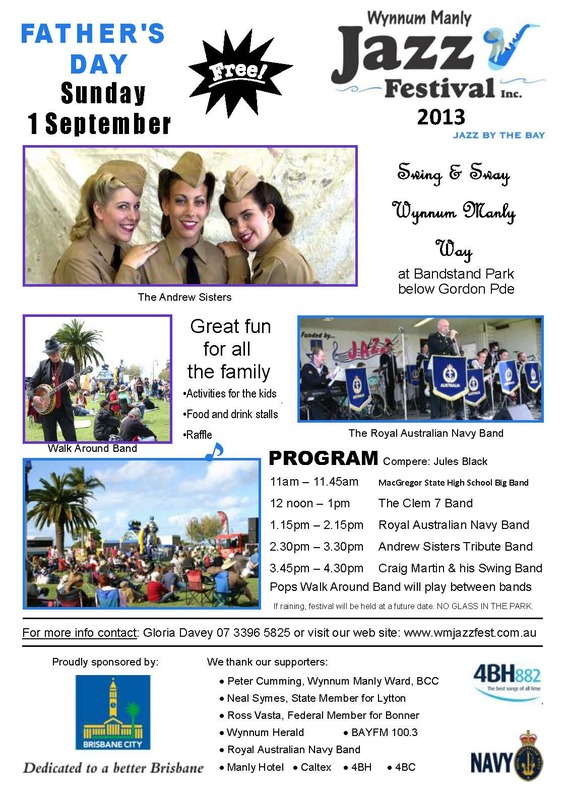 The Queensland Detachment of the Royal Australian Navy Band are a full sized Big Band and perform a range of music, from classic vocal swing numbers to groovy Latin beats. Craig Martin is well known in Brisbane Jazz circles as one of our favourite swing singers, performing at Twin Towns, the Redlands Performing Arts Centre, Jupiters Casino and the Brisbane Jazz Club. Together with his Big Swing Band, Craig will perform songs from his repertoire, which includes such classics as It Had to be You, Moondance, I've Got You Under My Skin and Sway. You can find out more about Craig and hear some of his performances on his Website. There will be plenty of food and drink offerings available from mobile vendors, including wood fired pizzas, gourmet hot dogs, hamburgers, salad rolls, drinks, an outback diner, ice-cream and slushys, tea and coffee. If these don't tempt, then you can always bring your own picnic basket and rug (don't bring glass bottles or cups), or visit one of the nearby fish and chipperies. Kids are also in for some great entertainment, with a variety of rides on offer. These include a jumping castle, giant slide, the teacup ride and laughing clowns, or for free fun, head down to the other end of the park and have fun at the council playground which is not far from the bandstand. The long range weather forecast for Sunday 1st September is for sunny skies, however if you are concerned about the weather, listen to BAYFM Radio 100.3 for updates. For a relaxing day full of fabulous music, food and fun, bring your picnic rugs, folding chairs and hats and enjoy some jazz while overlooking the beautiful Moreton Bay from 11am until 4:30pm this Father's Day.